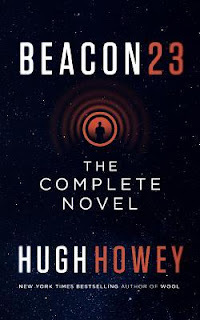 Beacon 23 takes place in a future where man has made space travel common and of course from there, humanity ends up having known alien enemies. We are introduced to a lonely (intentional) man as we follow him on his duties of keeping his space beacon operational. A beacon, much like a light house on the edge of the ocean, can be a lonely post. Unless that's what you want. And this space beacon is truly akin to a lighthouse because they are put in places to warn passing (space) ships of travel hazards in the region. We're then introduced to the day-to-day routines of our main character as he struggles with the solitary mundane duties that come from being pressed into service to man these lonely outposts. As the story develops we learn about what makes him tick, from simple to complex issues. In this Howey excels. He wraps us up in the minds of his characters and we almost become them. We learn in an excellent outline, how our hero came to wanting to being alone, and at one point, you start to understand PTSD better than ever, as you start to understand how he comes to not trust his own mind and his fear of failing is quite sobering. So when we learn that our primary character chose to be out here alone, we fully get it. Thus, throughout this 5-short-story tale we learn much about our hero of sorts. With titles like Pet Rocks, Bounty, Company, & Visitor, you think you can almost piece the story together from there, but alas, can you? This is another great Hugh Howey story from the man who invented the world of the Silo. If you've read any of his books, you know you will enjoy this one. If not, I'd say give it a try. It may feel dark and it may feel lonely, but if it wasn't written well enough, it would never inspire any kind of emotion like that. I came to totally enjoy Hugh's imagination when he wrote the Silo series, and this read is no different. If you don't believe me, would you believe the 921 reviews on Amazon that average out to a 4.2/5 stars? I read the Silo series after your recommendation and really enjoyed them. The first one was the most in depth to my mind but all 3 were good. Have you read his "Sand" book? Paul, yes, I did. I ate up most of Hugh Howey's work in the same year I found him. I am going to write about another totally awesome book of his (not in a series) in a little bit! Keep your eyes peeled!